Over the last few years, Nairobi has fast turned to a Silicon Savannah blossoming into a regional model for technology innovations even attracting global attention. Nairobi is teeming with international ICT companies’ bases, mobile money transfer platforms, and e-commerce giants.What is the secret to becoming the topic investment destination for technology companies? The achievements that technology players have been achieving would be impossible without affordable and fast internet infrastructure. A fiber optic cable covering over 4,500 miles with landing points in Mombasa Kenya and Fujairah in UAE helped to increase internet speeds to a higher level and connect Nairobi to the rest of the world. The 40Gb/s and still upgradeable to 640 Gb/s reduced the cost of communication by up to 10 times. 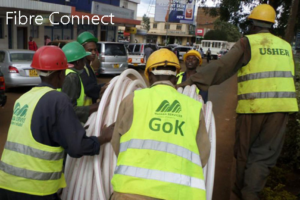 Price wars among the mobile network providers also brought an enabling environment to suit tech –oriented businesses.Internet providers such as Zuku and Jamii Telcom have taken advantage of fiber connectivity to launch interesting packages and method of selling bandwidth to their customers. The impact of fiber optic affects millions of the Kenyans and neighboring Uganda, and it is the reason why it still is one of the most significant disruptive technologies to date. Technology growth in Nairobi owes much to the emergence of tech hubs and labs. The emergence of tech hubs, institutions and labs has accelerated growth of the ICT sector by turning participants to innovators. One of the most famous is the iHub, an innovation and hacker space started by, TED fellow, blogger and entrepreneur Eric Hersman for the technology community. It is a meeting point for programmers, researchers, technologists, investors, designers, and young entrepreneurs. 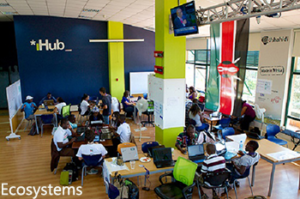 iHub offers a space for young entrepreneurs to get internet connectivity, mentorship, and possibility of funding to implement the ideas through connections to international organizations. Other tech hubs are Nailab, Growth Hub, Likemlab East Africa and Emobilis are among the many accelerating the knowledge and growth of technology. For example, The University of Nairobi has C4D lab while Kenyatta university is known for Digital learning program where students get tablets to study from anywhere at any time. 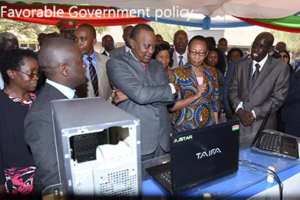 JKUAT University has a program to assemble laptops for use e-learning at Primary schools nationally. Every accelerator or incubators know that mentorship by seasoned entrepreneurs in the tech industry is a crucial element of success anywhere. Nairobi does not have any difference. It has entrepreneurs, returnees from Diaspora and linkage to the Silicon Valley mentor networks that play an active role to shepherd young talent through a start-up process. In addition to providing advice, they are living examples who have tried many fruitful and unsuccessful innovations. They proved that failure is not an end and this who falter will find their way another day. The Kenyan government through has come up with favorable policies to lower the cost of starting a business and licensing requirements. These measures have attracted direct foreign investments from multinationals that can afford to invest huge amounts of capital in the tech business. Wananchi Group and Access Kenya were some of the first biggest spenders in a race to tap into the ICT windfall. The enrolled a variety of internet provision services to break into the then new ICT market making way for much more to follow suit. Software developers, programmers, animators are a new club tech investors who invest billions into the economy. This lot is more capital –savvy that the first group that focused into internet supply boom. New investors are venturing into making innovations with funding from equity firms, capital markets and their money to mobilize resources necessary for achieving the projects. Some of those who complete the programs are beneficiaries of a presidential decree that allocates 30% of public contracts to young entrepreneurs more so in software. The government through an ICT Board has made major steps in pushing the ICT sector by introducing digital services, projects, initiatives and research. It is also among the main investors in technology with a stake in technology firms such as Telkom Kenya and highly profitable Safaricom. In the past, it has offered monetary support of up to $1.6 million to Nailab to help in the expansion. Kenya has a high number of weld educated and skilled workforce. Most of them are new graduates. This is a tech savvy generation with much hunger for innovation and passion for bringing change. Most of those possessing these key traits in attracting investors live in or around Nairobi. The contribution by each one of them to ICT leads to further development of technology. Kenyan universities educate energetic engineers and capable coders. While some of are lacking in practical skills that employers require, companies that attract the best of the crop benefit from high-value labor. Attracting the best from multi-national tech companies can be a challenge, but most start ups are emulating Silicon Valley and offering stock options to fill the gap between the salaries they can afford and market price. An ICT investor in Nairobi has a guarantee of getting labor that they can rely on to move to next level. 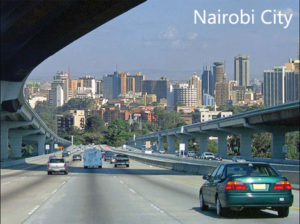 Nairobi is a city in an emerging economy and characteristically has fewer landline connections. Since the introduction of cell phones, many have found it easier and cheaper to acquire them. Over 80% of the Kenyans now access the internet and conduct online searches through their mobile phones. The market for Smartphones is growing steadily. Start ups and large companies have been tapping into the use of SMS and USSD. They leverage on them to provide subscription services such as betting, buying music, receiving alert and fun SMS, etc. Banks are also using the option to offer mobile banking among other provisions. Hundreds of organizations tap into the capability of the mobile telephony to provide things such education lessons or children helpline to impact the lives of many children. Social networks including Facebook, Twitter, and Whatsapp, are among the hundreds of applications that Nairobians access through their smart phones. As a result, there are a high number of apps that innovators are in putting on these phones for their users to use a certain aspect of Internet of Things (IoT) to perform certain functions as monitoring homes, securing doors, cars or controlling irrigation systems. Over the past decade, investment in infrastructure has risen sharply with much focus on upgrading in technology, telecommunications and power generation. Broadband connections have improved and increased since the landing of the sea cable. Telecom providers are racing to install fiber connections to offices and homes. Although the price is not the lowest, it is affordable. Some years ago, internet cost made it impossible to start ups. Kenya power has also improved the provision of more stable electricity supply which is a necessity for tech related companies. There was a time when power outages were a major issue. The result of advances in infrastructure is decreased production cost, increase in business competitiveness and number of competitors. Incredible speeds: It is the noticeable benefit of the 4G network. Increased bandwidth enables users to achieve faster data transfer speed and is especially an advantage for mobile devices. It gives superior uninterrupted connectivity for advanced tasks such as conferences and video charts. The younger generation of mobile owners can stream music videos and movies at a faster rate than they ever got and share information on line easily. More coverage: The coverage by 4G networks is wider than that by other systems such Wi-Fi that compels users to rely on hotspots in areas they visit. 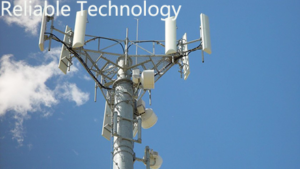 4G coverage covers 30 or more miles and overlapping network ranges thus users have an assurance of complete connectivity at all times. Security: A big problem with Wi-Fi networks is the likely compromise of online security. It is especially happens with mobile devices. The 4G network has come with complete security, privacy, and safety. It is especially of much benefit to the business persons and corporate with sensitive information on their mobile phones. Some of the success in Nairobi is attributable to the high penetration of mobile technology that has created a mass market for the tech-oriented businesses. The early existence of mobile platforms offering services such as money transfer has paved the way for creative minds to build on them. All they need to do in most instances is improve and innovate on the existing technology. It is easier than beginning to create something from scratch. Cloud computing is a practice of using network of remote servers on the internet to store, process and manage data rather than a personal computer or a local server. It uses services like PaaS (Platform-as-a-service), Iaas (Infrastructure-as-a-service) and SaaS (Software-as-a-service) to deliver hosting services over the internet. Cloud providers (companies offering these computing services) charge for their service according to usage in the same way that water or electricity companies bill their customers. It is an advantage to investors in the technology industry as the cost of servers, computational power and sizes are affordable. Tech firms only pay for services hosted and gave of the cloud. Many developers use Amazon web services and Windows Azure in particular for integrating mobile and web services as well as creating cross platform networks with varying capabilities. 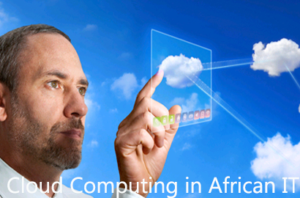 Kenyan start ups and corporate are utilizing the advantage of this opportunity to provide their cloud computing service. Kenyan Tech generation has access to several CMSs including WordPress, Joomla, SilverStripe, MOD X or Drupal. Some years before, Joomla was the most common platform but now WordPress has become more popular and is perhaps the leading platform in all countries because of the blogging capabilities. The other uses of CMS are shopping carts, discussion forums, and websites, etc. which are necessary for the online businesses. These CMSs power thousands of major websites, shopping sites. Thousands of blogs by individuals, corporate and new companies also rely on the CMS. The high profile of Kenyan tech community keeps on attracting more individuals and organizations from various sectors, facilitating learning and partnership between people with a diverse set of skills. The interaction with the tech community helps them to identify areas for further improvement with groups spearheading these efforts bringing people together to strategize on how to make improvements or reduce the gap between academia and the industry. Such efforts make ICT in Nairobi to continue developing. It creates a culture that attracts talent, encourages risk taking and many people to be part of it. It has become an infectious cycle that continues defining a vibrant tech community. Many investors especially start-ups shy from investing in some locations because of the struggle it takes to move their products or services beyond borders. Nairobi is the capital city of a country with a history of economic cooperation and friendly trade regulation allowing tech entrepreneurs to trade seamlessly in neighboring countries. It is not difficult to introduce products and expand the market to Uganda, Tanzania or Rwanda from Kenya. The trade trips by citizens of these countries to and from Nairobi means that a number of them know or use the tech services before the introduction to their countries. They will easily agree to invest in these products or services after introduction to their countries. Nairobi technology companies and start-ups benefit from the ease of the trade in the region, connections to India and US Silicon Valley. It is also an emerging leader in technology development and a significant number of Kenyans who study and work abroad have extended business networks beyond the region. Nairobi’s economy relies on several sectors, and ICT is a one of the most notable. It has become a business center with multinational Institutions. The strategic positioning has been attracting large tech businesses making it a center for technology in Africa. It is also a home to global research centers by giants such as Nokia and IBM.